Testing is a central part of development work at CBJ Tech AB. Laying great emphasis on realistically testing and evaluating technology at all stages of development assures the best possible performance in the end products. Testing requires sound methodology and careful monitoring of vital parameters if viable conclusions are to be drawn. Also, special facilities, equipment and knowledge is needed and this is a competence that we have built up at CBJ Tech AB. To assess effect in soft tissue we use 10% ordnance gelatin shot at 4°C. This gives a remaining bullet hole, or permanent cavity, from which cracks extend radially outwards. These cracks are caused by the temporary tissue stretch from when the bullet passes the simulant, called the temporary cavity. To visualize the permanent and temporary cavities the gelatin block is cut and measurements taken according to the Wound Profile Method by Fackler and Malinowski. With this data a plot, or Wound Profile, can be made. 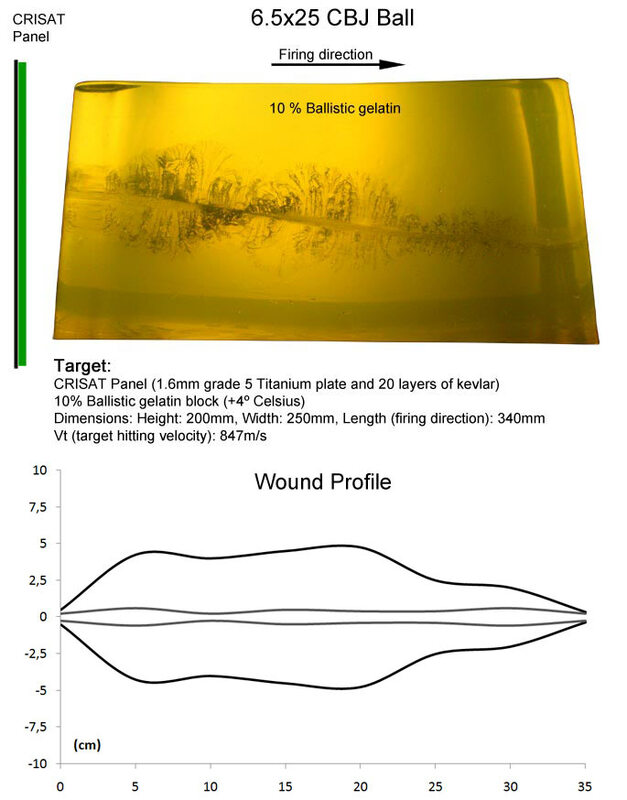 Wound Profiles serve as a good basis of effect assessment because it allows for easy comparison with existing battle proven cartridges with well documented effects. Wound Profiles for these cartridges have been obtained both from published data as well as from our own tests. Effect in soft tissue simulant is a very important aspect, but is only part of an assessment of overall terminal effectiveness. For instance, a typical hunting bullet will produce an impressive effect in bare gelatin, but would still in most cases be a poor choice as an all-round military bullet due to lack of penetration. In order to assess overall effectiveness several aspects other than effect in soft tissue have to be considered such as hit probability, penetration, handling characteristics etc. Concentrating on terminal ballistics, that is from when the bullet impacts the target to when it stops or exits, this means extensive testing is needed to give a good picture of what performance can be expected in a real situation. This mostly means testing penetration capacity against various barriers typical for the application and studying soft tissue effect in simulant placed behind. The tests we conduct include those standardized and internationally accepted tests that exist, typically the NATO CRISAT for military use and the FBI Ammunition Test Protocol for Law Enforcement applications. Furthermore we test performance against other barriers and make composite tests with different scenarios and according targets. One such test is a Soldier Pack Test. This and more tests can be found at the Downloads page.